This page has moved, redirecting. This comes with all the pre-required options for accurate translations of your Photoshop Document. 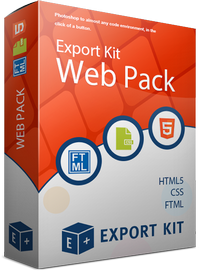 Export Kit is a one-stop solution for exporting Photoshop documents. Your exports are ready-to-go and work in all major support IDEs, respective of the Export type. 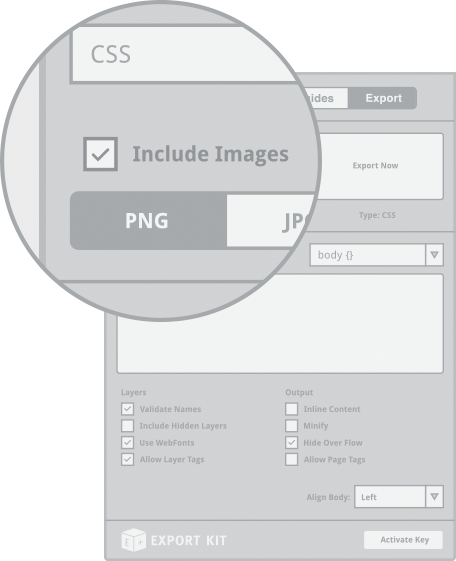 All required assets are included in your exports so you can use your project right away. 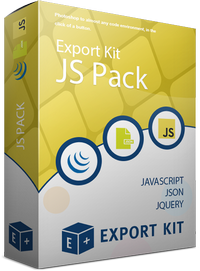 Learn more about Using Export Kit. 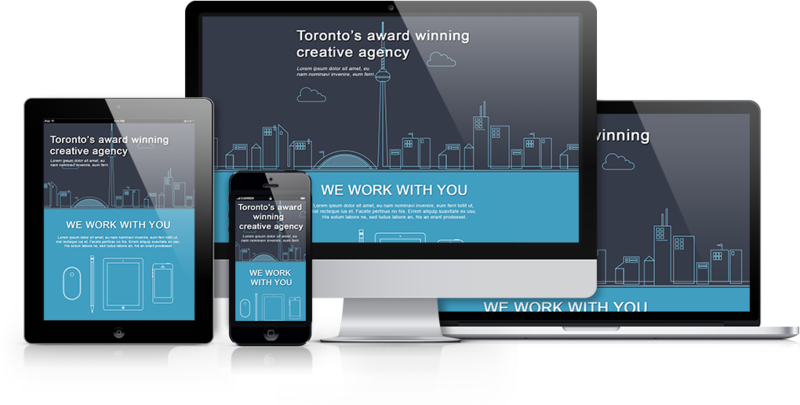 Take a look at some of the Export Kit output examples generated from the Photoshop PSD example file. 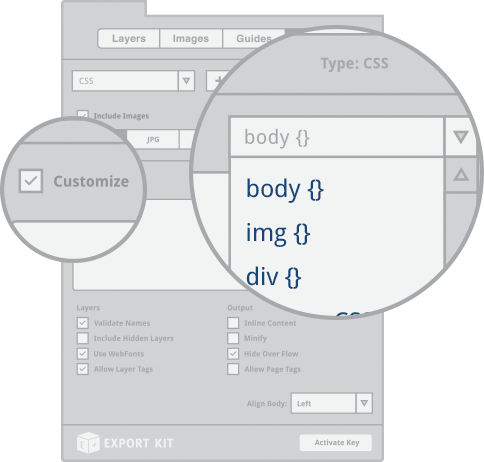 Click the icons below to view examples of the Export Kit outputs in each environment. You can see easily that Export Kit gives you pixel-perfect code from your Photoshop PSD – in any environment. View more Export Samples in our resources. This comes with all the add-ons for building data-driven applications from Photoshop. 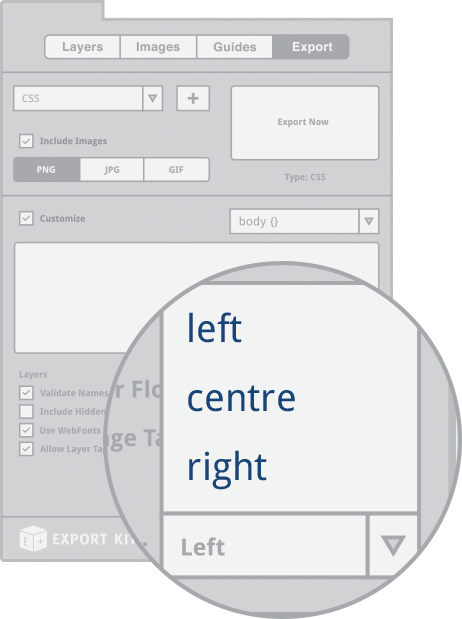 Export Kit Pro will allow you to save any custom configurations for easy reference the next time you need it. No need to remember old settings, save it as a pre-set and keep working! This is great when modifying an existing project or storing a custom client request for an output. All options auto save on each new export. Learn more about Using Export Kit Pro. 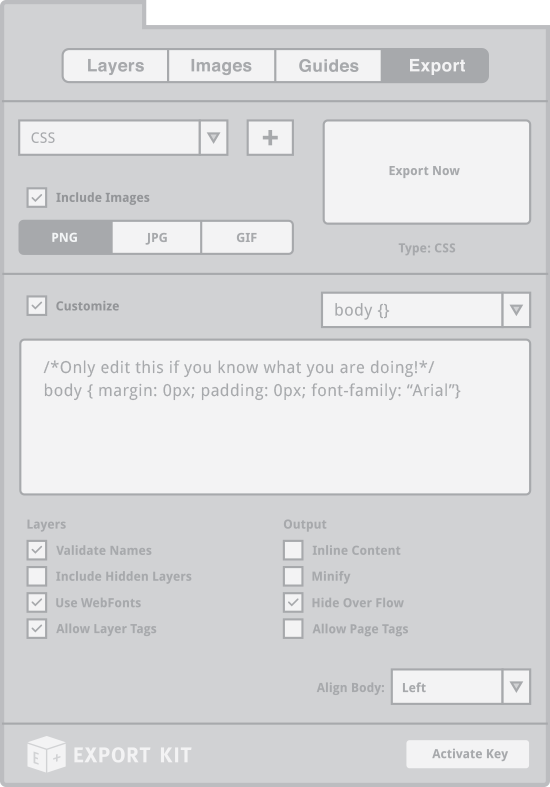 You can further personalize your projects by adding or modifying output content in a snap. Export Kit will give you the ability to change default output settings as required per project. 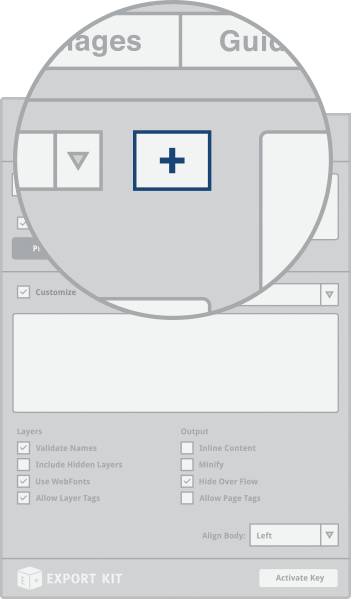 Additional layer support for total customizations of Photoshop layers during export. 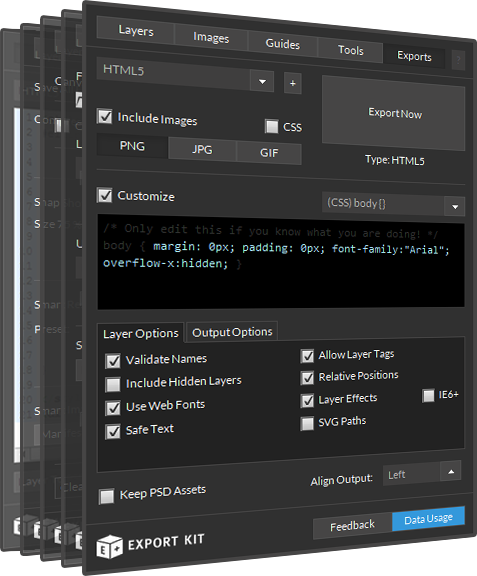 These options enable designers to customize projects on an individual basis when rendering Layer elements. 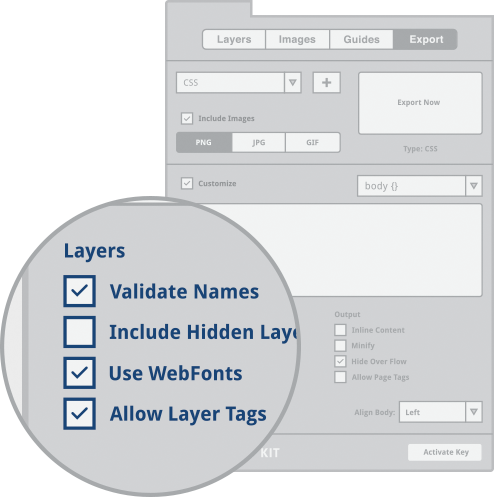 You can Validate Layer Names, Include Hidden Layers, Use WebFonts, and Allow Page Tags. Learn more about Export Kit Pro Layer Options. You can customize your export to the full extent with our custom output options. 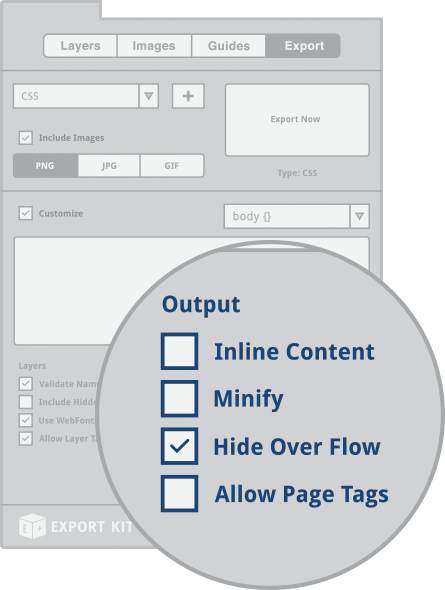 You can include Inline Content, Minify, Hide The Overflow, and Allow Page Tags. 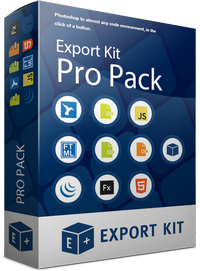 Learn more about Export Kit Pro Output Options. Set your default output alignment on the fly. You have the option of aligning your output project to the Left. Center, or Right of the screen. Use Product Builder to pick your price!